Warwick uses Spectra fiber from Honeywell to enhance the performance of many of our products. We have used Spectra in fabric for sailcloth as well as ballistic and aerospace applications. A highly processed ultra-high molecular weight polyethylene, Spectra is stronger and lighter than most commercial high-modulus fibers and has one of the highest strength to weight ratios of any man-made fiber. 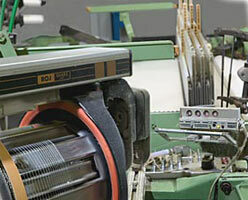 Warwick's manufacturing teams are experts in producing fabrics and flexible composites from Spectra. Warwick has also developed an excellent alternative using Vectran fiber, which is readily available at competitive pricing and provides performance levels that often exceed that of Spectra. "Spectra fiber is one of the world's strongest and lightest fibers. A bright white polyethylene, it is, pound-for-pound, ten times stronger than steel, more durable than polyester and has a specific strength that is 40 percent greater than aramid fiber. Spectra fiber is made from ultra-high molecular weight polyethylene that is used in a patented gel-spinning process. Polyethylene is a remarkably durable plastic, and scientists at Spectra Technologies have captured the tremendous natural strength in the molecular backbone of this everyday plastic to create one of the world's strongest and lightest fibers. The gel-spinning process and subsequent drawing steps allow Spectra fiber to have a much higher melting temperature (150°C or 300°F) than standard polyethylene. With outstanding toughness and extraordinary visco-elactic properties, Spectra fiber can withstand high-load strain-rate velocities. Light enough to float, it also exhibits high resistance to chemicals, water, and ultraviolet light. It has excellent vibration damping, flex fatigue, and internal fiber-friction characteristics, and Spectra fiber's low dielectric constant makes it virtually transparent to radar. Spectra fiber is used in numerous high-performance applications, including police and ballistic-resistant vests, helmets, and armored vehicles, as well as sailcloth, fishing lines, marine cordage, lifting slings, and cut-resistant gloves and apparel."